The Field Museum of Natural history says, “Darwin got it (mostly) right. But did he really? Last month we reported on the Life Over Time exhibit at the Chicago Field Museum of Natural History. We only had enough space last month to give a broad overview of the exhibit, and mentioned some specific errors in passing. We want to address some of those errors in detail. We’ve already dealt with Stanley Miller’s origin of life experiment on several occasions, so there is no need to talk about that again. This month we planned to address the claim that “Darwin got it (mostly) right” by tabulating the things Darwin got right and wrong, and then consider what they said about horse evolution, and peppered moths. Unfortunately, we have so much to say about Darwin, that our “six page newsletter” is ten pages this month, so we have to put off horse evolution and peppered moths for at least another month. Origin of Species is a book that practically everyone has heard of. Most people think they know what it says. Few people have actually read it. You have heard of Origin of Species, haven’t you? You know what it says, don’t you? Have you read it? See what we mean? One would think that Origin of Species would be required reading for every modern introductory biology class. It isn’t. As we examine it in detail, you will see why it isn’t. Darwin got it mostly wrong. If biology students read Origin of Species, the teacher would have to spend most of every lecture telling the students that what they read isn’t true. 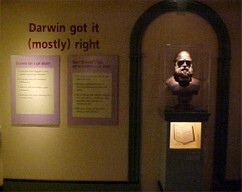 We and the museum apparently agree that Darwin got some things right and some things wrong. The sticking point is the word “mostly”. That is a subjective term that is difficult to quantify. So, let us examine what Darwin wrote, and you can decide whether Darwin was mostly right or not. Darwin observed that not every creature that is born lives long enough to reproduce after its kind. Certainly, he got that right. Ask a mathematician how many rabbits there would be on the Earth after 1,000 years, starting with a single pair, if all survived to maturity. Worse yet, imagine how many mosquitoes would be in the world today if none of them were eaten by fish or birds. The world is not overrun with rabbits and mosquitoes because not all of them survive long enough to reproduce. At best, the number of creatures that have offspring is equal to the number of creatures born. Who would argue that the number of creatures that have offspring is more than the number of creatures born? Creatures that were never born certainly can’t have children. It has been said that having children is hereditary. If your parents didn’t have any children, then you won’t either. We all know people who, through choice or circumstance, have remained childless all their lives. If you haven’t squished a spider, you know someone who did. Certainly Darwin was right when he said that more creatures are born than survive long enough to reproduce. Perhaps you were slightly bored or annoyed because we belabored the obvious. That was our intention. If you were bored or annoyed, it is because you realize that it doesn’t take any great intellect to appreciate the fact that creatures that aren’t born certainly can’t have children, and that not all creatures that are born do have children. So, the first thing that Darwin got right isn’t really worthy of a Nobel Prize. Darwin simply wrote down what anybody who ever thought about it already knew. Darwin’s second correct observation was that there are differences in offspring. You, no doubt, already knew that, too. Let’s face it. If you are fortunate enough to get to be a contestant on “Who Wants to be a Millionaire?” there are some people you would put on your phone-a-friend list, and some that you would not. There are some people you would ask to sing at your wedding, and some that you would not. There are some people you would ask to help you load a furniture truck, and some that you would not. People have different talents that are more useful in some situations than others. We could belabor this point to the point of annoyance, but Darwin has already done that. He spent the entire first two chapters of Origin of Species citing obvious examples of variation, as if nobody had ever noticed it before. Maybe he was trying to lull his readers into accepting everything he says by hypnotizing them with an enormous list of obvious observations. Then, when he makes his erroneous conclusions, his readers will have stopped thinking critically about what he says because everything up to that point is so obviously true. But let's give him the benefit of the doubt. It could be that he was just a really boring writer. For whatever reason, Origin of Species is filled with trivial examples of variation in species. Darwin was only partially right when he estimated the importance of “survival of the fittest” in determining which creatures left offspring. A gazelle that can only run half as fast as all the other gazelles probably won’t live long enough to reproduce. Although selection is powerful when it comes to eliminating the occasional individual that is dramatically below average in some important respect, it doesn’t have as much power when it comes to favoring those individuals that are above average. The “safety in numbers” theory says that you don’t have to be the fastest gazelle in the herd to escape when a lion attacks. You don’t have to outrun the lion. You just have to outrun at least one other gazelle. If the herd is large enough, there is probably at least one other gazelle slower than you are, and that’s the one that will get caught. The fastest gazelle doesn’t have any real advantage over the tenth fastest gazelle in a herd of 500 gazelles, no matter how much faster it is. Selection doesn’t favor the fastest gazelles--it eliminates the slowest ones. There is a subtle but important difference that Darwin failed to realize. There is some debate among scientists, even in evolutionary circles, that chance (rather than fitness) might be the most important factor in determining which creatures survive long enough to reproduce. Sometimes it is the fastest gazelle in the herd that wanders past the lion hidden in the grass. When a snake finds an egg, and eats it, it doesn’t matter if that egg contains embryo of the bird that could have flown the fastest, or would have had the sexiest plumage. The people who died in the World Trade Center were not the least fit for survival. Some died because they were unlucky. Some died because they were brave. None died because they were unfit for survival in a big city environment. Darwin was right to conclude that only inherited variations matter in the evolution of a new species. If the variation isn’t inherited, then the critter’s offspring have to start all over from scratch. The only way the variations can accumulate is if the variations are passed down from generation to generation. The only way that can happen is inheritance. So, he was right about that, and we give him some small amount of credit for stating it because it isn’t patently obvious. Even so, it still isn’t reasoning worthy of a Nobel Prize. Darwin didn’t know much about inheritance. That isn’t our claim-it is Darwin’s claim. Darwin frequently made appeals to ignorance when he didn’t have any data to back up his ideas. Darwin didn’t know how inheritance worked. Much of what he thought he knew about inheritance was wrong (as we shall see in a moment). But he argued that even though he didn’t understand how inheritance works, we could be sure that it must work the way he thought it worked. In other words, he argued from faith, not facts. To accept Darwin’s theory, people of his day had to believe in things that nobody understood. To accept Darwin’s theory today, people have to believe in things that are contrary to what modern science has discovered. Ironically, what he said was true, but what he meant was wrong. It is true that damage to the ovaries or testicles (from radiation or chemical agents) will cause birth defects, which makes the offspring different from other offspring. Scientists routinely subject fruit flies to x-rays and toxic chemicals to damage their reproductive organs in such a way as to increase the rate of mutations so the mutations can be studied. Darwin believed that acquired characteristics were inherited because exercise, nutrition, and climate, affected the reproductive organs. Daily milking of a cow would, he thought, produce increased milk-producing hormones in the cow, and these hormones would, through some method of which he was ignorant, affect the ovaries in such a way that its offspring would have more-developed udders. Modern scientists know that acquired characteristics aren’t inherited. You can go to the gym and workout until you have buns of steel, but any children you conceive have will still have baby-soft butts. Milking a cow doesn’t make her offspring give more milk. Darwin was entirely wrong on this point. Exercise does, to some extent, strengthen and enlarge some parts. Disuse does diminish some parts. But those “modifications” are not inherited, and therefore unimportant to the evolution of a new species. In other words, Darwin thought that when an animal is exposed to cold weather, it grows a thicker coat, thicker layer of fat, and has higher metabolism. If the exposure is gradual enough that the cold weather doesn’t kill the animal, these things might indeed happen. But Darwin also believed (without any evidence to support his belief) that the climate would affect male and female reproductive elements in such a way that the animal’s offspring will be born with a thicker coat, thicker layer of fat, and higher metabolism. Darwin got that wrong. Climate might cause individuals that already have tolerance to cold to survive when individuals without that tolerance die without leaving offspring. After several generations this will result in a breed (or variety) that is tolerant to cold. But, according to our hypothetical situation, the individuals that survived already had the tolerance to the climate. So, it doesn’t answer the question, “How did tolerance to cold originate?” Darwin thought that the climate caused the tolerance of cold weather to evolve, but he was wrong. Natural selection merely eliminated the individuals that lacked the necessary characteristics. Neither natural selection, nor exposure to cold, produced a new characteristic. It merely eliminates the individuals that lack an already existing characteristic. The ratio of animals with the advantageous characteristic to animals without the advantageous characteristic will change (one could say the ratio “evolves”), but features don’t change. Darwin would “only allude to what may be called correlation of growth”. Although it was only a minor part of his theory, we need to address it. Here is what he said. His observations are generally correct, but not for the reason he thought. (A modern observation along these lines is that German shepherd dogs tend to have hip problems.) Although Darwin thought it had to do with a “change in the embryo or larva” that is somehow related to growth of other features, it actually has a genetic cause that is present from the moment of conception. Modern scientists recognize this phenomenon is a problem associated with inbreeding. Darwin was not the first scientist to recognize the dangerous side effects of inbreeding. Darwin is known to have studied a 1611 translation of an ancient text that made the exact same observation. 15 If Darwin deserves credit for recognizing “correlation of growth,” then we must also credit Moses for being an expert in genetics, (or for quoting someone else who was). In other words, he thought that exercise (“use and disuse”), climate and nutrition (“the physical conditions of life”), and physical deformation of the embryo caused by “correlation of growth,” were all mechanisms that produced variations which could be inherited. He thought that there was no limit to this change. He was absolutely wrong on every count! He thought that if you planted cabbage in poor soil, the cabbage would acquire the ability to grow in poor soil as a “direct action of the poor soil.” We have already shown that he was wrong about acquired characteristics being inherited. He should have said that a cabbage breeder developed several new varieties of cabbage by carefully controlling the pollination, but that isn’t the error we want to talk about now. Darwin’s observation about intercrossing was correct, but he failed to recognize the impact to his theory. If reproductive isolation produced new varieties, the varieties would remain distinct only as long as reproductive isolation was maintained. But it is hard to maintain reproductive isolation in the natural world. As soon as you let your pedigreed dog loose, it will find some other dog of another breed, which will result in a litter of mutts. As long as Darwin’s finches remain isolated on their respective islands, they will remain distinct breeds. But when the barriers are removed, the finches will eventually revert to the wild, aboriginal stock. Darwin failed to realize the difference between varieties and species. He thought “varieties are species in the process of formation, or are, as I have called them, incipient species.” What was the evidence? “That this does habitually happen, we must infer from most of the innumerable species throughout nature…”. His reasoning was simply that species exist, and they must have come from somewhere, so they must have come from varieties. That isn’t sound reasoning--it is baseless speculation. He didn’t see any reason to limit the process of modification because he didn’t understand genetics and information theory. He recognized the problem of inbreeding (which he called “correlation of growth”), but didn’t realize that it is associated with a genetic limit. He recognized, but ignored, the fact that “intercrossing” removes what limited variation actually occurs. Selective breeding can only remove undesirable genes. It doesn’t create new genes. A species would have to acquire new genes to acquire new characteristics. Neo-Darwinists believe that mutations can create new genes that contain new genetic information. Neo-Darwinists are wrong, too, but that’s beside the point. We are trying to determine if Darwin, not neo-Darwinists, got it mostly right or not. Darwin thought there was no limit to the amount of variation in a species that could be caused by exercise, diet, and environment. Darwin got this wrong. It will never be capable of full proof because it isn’t true. The notion was largely supported by Ernst Haeckel’s embryonic drawings that are now known not only to be inaccurate, but fraudulent. Darwin didn’t actually claim this was proof of his theory. He merely said, “This view may be true.” But if he didn’t think it was relevant, why did he include it in his book? We have to think that he believed it, otherwise he would not have mentioned it. That’s why we have decided to include it in the list of things that Darwin got wrong. The modern term for “rudimentary organs” is “vestigial organs.” Modern evolutionists don’t very often try to argue that vestigial organs are evidence of evolution for two reasons. One is that they know that acquired characteristics aren’t inherited. So, organs will not shrink or become less efficient over many generations through disuse. The second reason is that we now know that most, perhaps all, “useless” vestigial organs have uses. It is true that you can survive without your appendix, tonsils, or one of your kidneys. That doesn’t mean they are useless. It merely means that it is possible to survive with slightly reduced capability without them. Darwin got this wrong, and most evolutionists know it. Darwin was well aware that the fossil record doesn’t support the theory of evolution. He was right that the fossil record doesn’t support evolution. He was wrong that the fossil record is incomplete. It is very complete for shellfish. Have you ever heard an evolutionist claim that missing links between the various kinds of shells have been found? Probably not. That’s because it is the absence of transitional forms for shellfish (invertebrates) that led invertebrate paleontologists to propose the Punctuated Equilibrium theory to explain the lack of transitional forms. Richard Dawkins is the best-known modern champion of Darwinian evolution. In his chapter, “The Museum of All Shells” in his book Climbing Mount Improbable, he describes his Blind Shellmaker program. In it he recognizes that a snail is just a coiled-up worm. Furthermore, a conch is just a snail that isn’t coiled in a single plane. And, if you take a snail, and unroll it into a cone, and make the cone fatter and shorter, it looks a lot like a clam shell. So, by varying some parameters in his Blind Shellmaker program he can make one program draw a clam, worm, snail, or conch. Dawkins uses his Blind Shellmaker program to show how shellfish could have evolved. No, more than that. His program shows how shellfish must have evolved. In fact, what his program shows is the sequence of intermediate forms that must have existed if shellfish evolved. What you won’t find in Climbing Mount Improbable is a table showing the correlation between a Blind Shellmaker output sequence and actual fossils. That’s because the sequence of intermediate forms predicted by the Blind Shellmaker isn’t found in the fossil record. On the other hand, we have far fewer hominid fossils than fossil sea shells. Some of these hominids are represented by a few teeth, a smashed skull, or a partial skeleton. This is where the evolutionists claim the fossil record supports evolution. This is in the tradition of Darwin’s appeal to ignorance. We don’t know what intermediate forms are missing. And, if we allow for our ignorance, we can see that all the intermediate forms must be there. Darwin correctly realized that there were four serious problems with his theory. LONG before having arrived at this part of my work, a crowd of difficulties will have occurred to the reader. Some of them are so grave that to this day I can never reflect on them without being staggered; but, to the best of my judgment, the greater number are only apparent, and those that are real are not, I think, fatal to my theory. These difficulties and objections may be classed under the following heads:-Firstly, why, if species have descended from other species by insensibly fine gradations, do we not everywhere see innumerable transitional forms? Why is not all nature in confusion instead of the species being, as we see them, well defined? Thirdly, can instincts be acquired and modified through natural selection? What shall we say to so marvellous an instinct as that which leads the bee to make cells, which have practically anticipated the discoveries of profound mathematicians? If evolution were true, there should be innumerable transitional forms alive today. There aren’t any. Darwin could claim that the fossil record was imperfect, but he could not claim that there are many species alive today that we don’t know about. He was correct that the clear distinction between species today argues strongly against his theory. He was right that many things, like echolocation in bats, and vision in a wide variety of creatures, could not be produced by inheritance and natural selection. He was right that instinct, which certainly exists in many creatures, cannot be explained by evolution. He was right that breeding across species lines rarely results in viable offspring. And those rare cases that are viable are sterile. If one could cross an alligator with a chicken, then remarkable new species might evolve. But you can’t cross radically different creatures, producing new creatures that might win the battle for survival. Darwin recognized that crossing varieties of the same species does produce fertile offspring. Although he apparently didn’t fully understand the problems with inbreeding, modern scientists do. Modern scientists understand that crossing varieties mixes up the gene pool, and makes species less susceptible to genetic diseases. Darwin got some things right. Ironically, most of the things he got right were observations that argue against evolution. Let's look at all of Darwin's conclusions in tabular form. More individuals are born than can survive. There is a lot of variation in species. Evolution depends upon inherited variations. “The laws governing inheritance were quite unknown” to Darwin. “Correlation of growth” (inbreeding) has side effects that limit variation. “Intercrossing” causes variations to revert to the norm. The fossil record doesn’t support evolution. There are no living intermediate forms. Complex structures, such as the eye, and echolocation, could not have evolved. Instincts can’t be explained by natural selection. One can’t breed diverse species to produce new fertile species. Fitness is more important than luck when it comes to survival. Features developed by exercise are inherited. Features diminished by disuse are inherited. Climate causes variations that are inherited. Diet causes variations that are inherited. There is no limit to inherited change. “Rudimentary organs” are proof that features diminished by disuse are inherited. The fossil record would support evolution if it were more complete. We think you will agree that, if you ignore the things that Darwin got right that argue against his theory, Darwin got very little right. Not only that, you can see why Origin of Species isn’t actually studied in most biology classes. Most high school and college biology teachers, and the management of the Field Museum, probably really believe that Darwin got it mostly right because they haven’t read Origin of Species themselves. They are just repeating what their teachers told them, who were repeating what their teachers told them. In the nineteenth century, scientists did actually read Origin of Species, and “if we remember how profoundly ignorant” they were, we can understand how they might have believed it. The story has been passed down from generation to generation of science teachers without much critical examination. Now it is time to re-examine the theory of evolution in light of twenty-first century science. Now is the time to realize that Darwin got it (mostly) wrong. Modern science is against evolution.